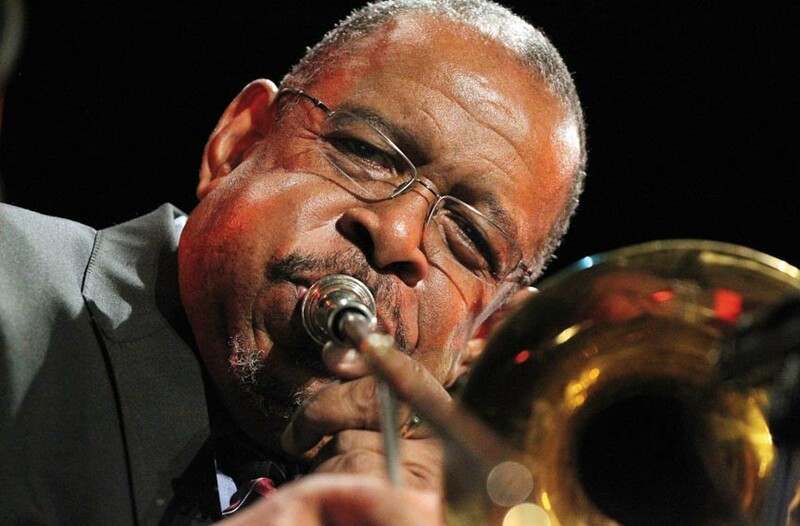 Fred Wesley | 2012 Folk Fest Guide | Style Weekly - Richmond, VA local news, arts, and events. In the late '60s, the Godfather of Soul, James Brown, had a radical break with his orchestra, which quit over a pay dispute. In its place, Brown hired some fiery teenagers from Cincinnati, bassist Bootsy Collins among them. The bandleader who trained these marginal players, known as the J.B.s, and defined the hard-hitting sound of Brown's revolutionary '70s work, was trombonist Fred Wesley. "With James Brown, I was doing something brand new every day," Wesley says with the charm of a legendary sideman who's seen it all. "Some people say Brown was crazy. But what I liked about it was no patterns. Go with your rhythm, go with your funk. Free your mind." His first recording session with Brown was "Say It Loud — I'm Black and I'm Proud," a 1968 hit which became an anthem of the Black Power movement. But Wesley was always a jazz player at heart, which would be a steady source of frustration for him. "Like Maceo, Fred is one of the originators. His '70s work with James was more with the times. Less complex and jazzy," says DJ Pari, a local journalist. "He kind of had a love-hate relationship with James. Fred would try to sneak in jazz parts on the J.B.s' solo records." Pari, who toured with James Brown in the late '90s and managed associated artists Marva Whitney and Lynn Collins, knows Wesley and particularly loves his instrumentals. Wesley got his start playing with college friends in Hank Ballard's band before learning how to be a bandleader with Ike and Tina Turner in the early '60s. "Ike was great. He had control and vision, the way he talked to the band and got what he wanted out of them," Wesley recalls. "The way the horns interacted with the rhythm section. He did it better than most." Wesley, who was responsible for Brown classics such as "Papa Don't Take No Mess," "Doing It to Death" and "Hot Pants," among others, typically wrote and arranged pieces with Brown overlaying vocals. "James had ideas about the harmonic stuff," Wesley says. "He didn't know how to say it, but he would describe what he wanted. We put it together." Fed up with Brown and hoping to get back to jazz, Wesley eventually left. After a two-year stint with Parliament Funkadelic he got what he calls his "best gig ever" with the Count Basie Orchestra in the late '70s. "I was most happy with Count Basie Orchestra," he says. "I could have done that for the rest of my life, but it didn't pay much." After battling drug addiction in the '80s, chronicled in his autobiography, "Hit Me, Fred: Recollections of a Sideman," Wesley started leading his own band, the new JBs. They'll be playing their old funk chestnuts such as "Pass the Peas" and "Breaking Bread" at the Richmond Folk Festival. Wesley still tours internationally, receiving royalties from Brown's catalogue and hip-hop samples of his work. He recently played on two tracks for a comeback album from Richmonder D'Angelo, which he says should be a "great" when it's finally ready. For now, Wesley says his priority is "staying alive." The 69-year-old has suffered recently from weight issues and arthritis. "You never know what way you gonna go in life," he says. "I never expected to be with James more than two months at the time. I was a jazz trombone player — like Frank Rosolino, Cannonball Adderly. I never thought I would be known as Funky Fred, the funkiest trombone player in the world. Doesn't matter how hard you fight it, life teaches you to roll with it."